Ethan Gilsdorf watches RoboCop (2014) and remembers RoboCop (1987). The PG-13 remake isn't bad, but has less to say than the original, and, worse, is not as funny. Each generation conjures the bot bad dream it deserves. From Metropolis to The Terminator, 2001: A Space Odyssey to Star Wars, science fiction movies are the outlet for our collective neuroses about technology. What is humankind’s place in a world of robotics, smart operating systems and artificial intelligence? Can robots have feelings? What, finally, separates man from machine? December’s Her, from director Spike Jonze, plunged us into this abyss of the Uncanny Valley. That premise: In the very near future, ordinary guy Joaquin Phoenix falls for his intuitive, oh-so-human OS "Samantha," voiced by Scarlett Johansson. This notion that our computers and robots might become so sophisticated that we’d develop emotional or romantic attachments to them goes back at least as far as 1984’s Electric Dreams, which explored a man-woman-Apple love triangle. Over film history, we’ve conveyed, and perhaps tried to allay, other fears of robots supplanting humans, cyborgs taking over the world, and androids being able to do what we do best—namely, to feel things. A brief overview: the “False Maria” robot double from Metropolis (1927); Gort from The Day the Earth Stood Still (1951); the creepy intelligence of HAL 9000 in 2001: A Space Odyssey 1968; homemaker automaton Rosey from The Jetsons TV show (1962); Yul Brynner’s deadly Gunslinger character from Westworld (1972); the self-deprecating brainiac C-3PO Star Wars (1977); corporate turncoat android Ash from Alien (1979); femme fatale Rachael, Blade Runner (1982); Arnold Schwarzenegger as the time-traveling android assassin T-800 in The Terminator (1984); Spock-like trying-to-be-human Data, Star Trek: The Next Generation (1987); Keanu Reeves’ cybernetic brain dude in Johnny Mnemonic (1995); boy-replacement robot David from A.I Artificial Intelligence (2001); all the way down to last year’s half-man, half-robot Matt Damon in Elysium and Her. Now comes the RoboCop remake. Plenty has changed since Paul Verhoeven’s 1987’s witty, funny satirical original. Not only is Ronald Reagan not inhabiting the White House anymore, but the Mac computer just celebrated its 30th anniversary. And we’ve fallen for our Apples, just like Adam and Eve. Which do we fear more, our computers, or our own selves becoming more computer-like? 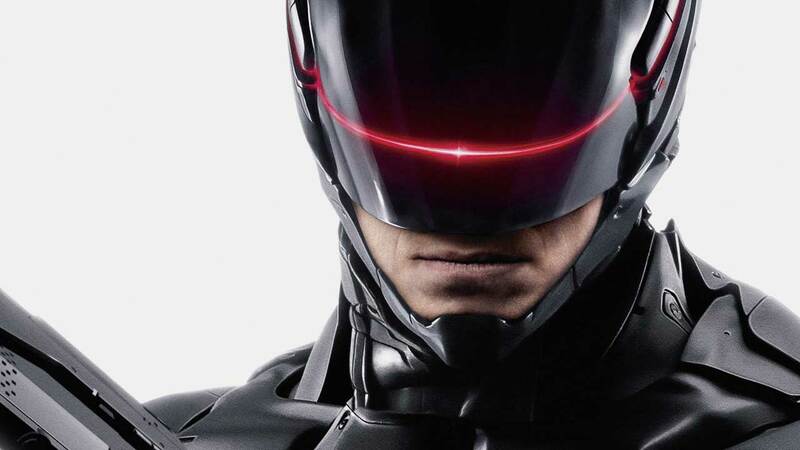 The new RoboCop isn’t social criticism, but it provides some answers. Directed by Brazilian native José Padilha (Elite Squad), the film opens as good dad, husband and Detroit cop Alex Murphy, played by Joel Kinnaman of AMC's The Killing, is blown to bits in an organized crime hit. Local military robot and drone maker OmniCorp, headed by Michael Keaton, sees its chance to build a part-man, part-robot police force. After all, it’s the year 2028, and military bots have already helped wage the peace during the U.S. military’s Operation Freedom Tehran. Why not bring them home to fight crime on America’s streets? Because legislation has been passed to prohibit robocops. "Why is America so robophobic?" booms arch-conservative talk show host Pat Novak, played with self-parodying bravado by Samuel L. Jackson. Scenes from his Fox News-like program provide clunky, expository backgrounders on the nation’s political climate 14 years from now. Americans aren’t ready for all-robot policemen busting gangs on their mean streets. Heck, in 2014, we’re still weirded out by the prospect of Amazon’s proposed delivery drones. But what’s not to love? Robots can’t fall prey to corruption. They don’t get tired. They’re not racist. They don’t make bad decisions. They just react to the data they’ve been given. Right? After running focus groups and polls, OmniCorp’s Keaton convinces his head scientist, Gary Oldman, to engineer a solution. "We've gotta give Americans a product they can love, a product with a conscience, something that knows what it's like to be human,” says Keaton with lip-puckering glee. “We're going to put a man inside a machine." With only a few functioning body parts remaining, Alex Murphy is that human, and robo guinea pig, for a new line of cyborg-like police officers. Co-written by newcomer Joshua Zetumer with help from original RoboCop (1987) screenwriters Edward Neumeier and Michael Miner, Version 2014 plays with some clever ideas. With only a few body parts and brain remaining, and the rest of Murphy made of steel and circuits, what does it take for him to remain human? The first interaction between Dr. Frankenstein-esque Oldman and his monster --- a human head, a heart and a set of lungs in see-through container, and a right hand, all attached to a kind of giant iPod docking station --- is fascinating and comical, both gross-out and laugh out loud. These are all engaging ideas, but the script goes on to take on too much. Focusing on Murphy’s own struggle to reconcile his old and new self would have been enough. As would the family drama; much like with families welcoming wounded veterans returning from war, Murphy’s long-suffering wife and son want their old husband and dad back. Kinnaman’s weepy, Swedish eyes do a decent job emoting his pain. But for a good portion of the film, his Murphy is in battle mode. With his black visor down, he emotes about as much as Schwarzenegger on the T-800 warpath. The requirements of the action film genre also require Padilha to stage three major and fairly mindless, video game-like shoot outs. As the kill tally ticks up at the top of the screen, messages like “Threat” flash on the viewfinder of Murphy’s robo-consciousness. These are sequences you can see in Call of Duty or Halo. That’s not the future, that’s now. Along the way, there’s still some fun to be had. On the wall of Keaton’s office you’ll see three twisted, half-man, half-slabs of bacon paintings. Score one for the Production Designer, for cunningly inserting into RoboCop Francis Bacon’s bleak existential outlook on the human condition. Also, look for Jackie Earle Haley (the bad boy slugger from the 1976 classic Bad News Bears, as well as the child molester in Little Children). Haley plays Mattox, a robot trainer/coder skeptical of Murphy’s chances against his platoon of 100 percent robots. Mattox is also fond of calling RoboCop the “Tin Man.” (Which makes me wonder, Was L. Frank Baum’s man of metal the original cyborg?) Mattox also wields a gun called the “TSR-66.” Roll to hit Gary Gygax. Another chuckle comes when Keaton’s henchman, played by Christian Slater soundalike Jay Baruchel (This Is the End ),” is threatened by RoboCop. Gun aimed at his head, Baruchel pleads, “I’m just from marketing.” Another tasty social comment: The factories that build and test OmniCorp’s drones aren’t based in Detroit, but China. There’s two reasons to remake a successful film like Verhoeven’s original. One would be to have something new to say. In the new RoboCop, the original’s story has been updated to include drone surveillance, an issue slightly more relevant to modern audiences. But José Padilha and his screenwriters didn’t find much to do with that premise. The toothless, one-note political commentary of Jackson’s right wing pundit parody wins few points. Likewise, the true villain of the film --- what Murphy tilts against --- ends up merely another personification of corporate greed. Keaton’s no evildoer. He simply wants his robot company to make more dough. Which raises the other reason for the franchise reboot: to make money. Fans of the first RoboCop will be left wishing the remake was more biting, more dark, more funny. The final irony is this. The film suggests a future when we’re suspicious and uneasy about technology doing our dirty criminal work for us. Yet today, in 2014, computers are already doing this for us. We humans can’t resist our devices. We’re tethered to our laptops and smart phones as if they were hard-wired into our central nervous systems. Google, Foursquare, E-ZPass, iPads, and countless other apps, social networks, and devices are collecting data on our every move, as bad as any surveillance drone. It’s only a matter of time before Facebook takes military action, or your iPhone fires the first shot.